Ahava is the Jewish LGBT group on campus, and is sponsored by Hillel. Ahava allows the community to explore LGBT and Jewish identities in a safe, open environment. The group's goals include advocacy, providing a social space for these communities, and sponsoring initiatives including discussions and lectures on issues relating to the intersectionality between LGBT/Jewish identities. Alliance for Inclusion, housed in the Dental School, aims to educate dental students, staff, faculty, and dental professionals about lesbian, bisexual, gay, and transgender issues in hopes of encouraging awareness, as well as providing perspectives in treating LGBT patients. The organization hopes to foster a welcoming environment for LGBT students, staff, faculty, and patients at the Dental School. The Coalition for Queer and Trans People of Color is a group of students, faculty, and staff all committed to building community around, and highlighting the lived experiences of, queer, trans, and similarly identified people of color. Our mission is to enrich the lives of queer and trans people of color at the University of Michigan, while pursuing broader community transformation around issues of social and racial justice. 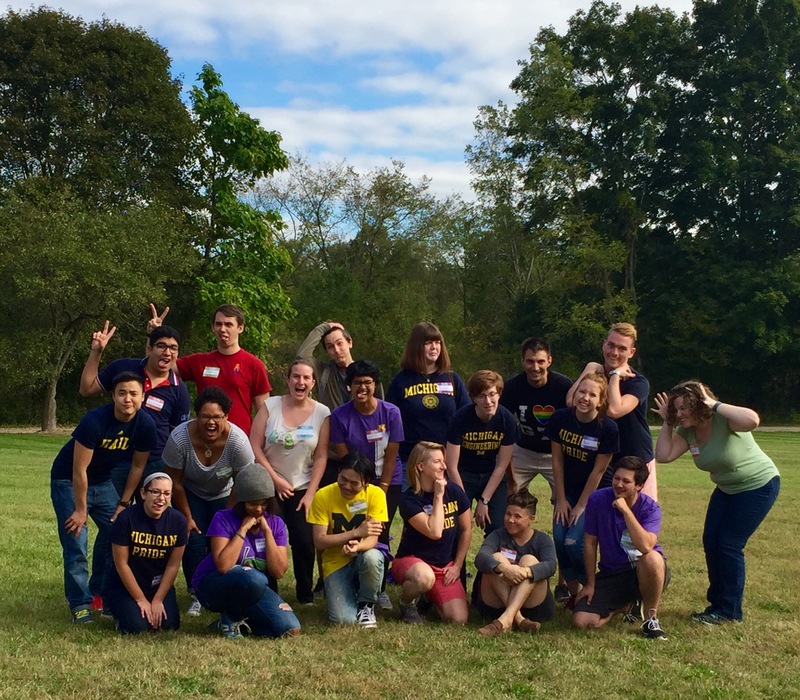 LambdaGrads provides social, education, activist, and support activities targeting the lesbian, gay, bisexual, transgender, queer, questioning, and ally graduate and professional community (in any academic unit) at UM. Our mission is to bring together LGBTQ identified people at the University of Michigan in order to create an inclusive and accepting community, working with both individuals and other LGBTQ organizations on campus. We aim to combine social events for LGBTQ individuals with service, activism, and with the objective of social equality. Creating more awareness for LGBTQ issues and educating the larger community is another primary objective. Together, we hope to create a better world, pushing LGBTQ issues to the forefront of activism, social justice, and public policy. Networking, Professional Development, social activities and Activism opportunities for undergraduate and graduate LGBT students in the STEM community. We're an organization dedicated to building a community for LGBTQ students in STEM fields and providing them with resources on navigating their identities in a professional setting. For more information, check out the Facebook page here (UM specific). The mission of SGDPH is to increase visibility of sexual and gender minority students, faculty, staff, and communities as an effort to prevent discrimination, promote awareness, protect individual identity, and create a diverse, equitable, and inclusive community for all students. Out for Business builds community among the LGBTQ+ students at the Stephen M. Ross School of Business and raises awareness among Ross faculty, staff and students of the issues facing LGBT individuals in society. Out in Public is the LGBTQ and ally group at the Ford School of Public Policy. We seek to create a welcoming space for LGBTQ people at the Ford School, engage the wider Ford School community in dialogue about LGBTQ issues and connect with other LGBTQ groups across campus. Bachelors students, Masters students, PhD students, faculty and staff are all welcome. Our Mission: to add the voices of lesbian, gay, bisexual, and transgender law students to the dialogue of the law school and university communities. OutMD seeks to create a safe space for LGBTQ identified persons and Allies within the medical school and bring awareness to the disparities LGBTQ identified persons face in the health care setting as both patients and providers. We support these aims by hosting regular meetings, organizing lectures and panels, and sponsoring students to attend conferences related to LGBTQ health disparities. For the school, our activities will create an inclusive atmosphere and provide important knowledge for future physicians when caring for this population. Psych OUT at The University of Michigan was founded in 2016 by a group of graduate students who were interested in creating an inclusive space for queer graduate students in The Department of Psychology. Our mission is to create and foster a community for LGBTQ+ individuals in the department and foster a community of academics that promote queer scholarship in our sub-fields and across campus. Our mission is to promote education and action around LGBTQ+ related legislation, achieve equality for LGBTQ+ identified people, campaign for politicians who will advocate for our causes, and create a safe space for all students through education, outreach, advocacy, and tolerance. Email stonewalldems-owner@umich.edu for more information about meeting times, events, and our organization! TransForm is an organization dedicated to providing resources, activism and support for the trans* community at UM. Meetings are primarily intended for trans* students and trans* community members, while allies are encouraged to check in often to inquire how they can best support the organization. For more information, check out the Facebook group here.